It is a hard to believe that this great lady left us 10 years ago. I have not even heard much buzz around the jazz community this month. It was shortly after her passing that a friend introduced me to this wonderful album, These Are The Blues. My own Ella experience up to this point had been swinging standards and beautiful ballads. On this 1963 recording, Ella travels down a different road, the blues. Most of the songs for this album were written in the 1920’s and performed by blues greats Alberta Hunter, Bessie Smith, Louis Armstrong and Ma Rainey. Ella brings a magic that is all her own to these timeless classics. Ella sings this lyric in “St. Louis Blues.” I love the suggestiveness of it. It tell you enough without giving it all away. 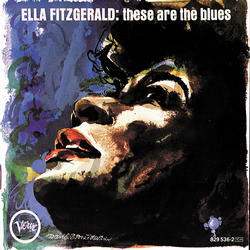 It is followed by the signifying “Hear Me Talking to Ya.” She opens the album with Bessie Smith’s “Jailhouse Blues.” As you listen to the song, you might not expect Ella to sing such an “adventurous” song but she wholeheartedly embraces the blues like she has embraced every genre of music that she has sung. I first heard Aretha sing “Trouble in Mind.” Ella’s rendition starts off simmering and swings into a boiling kettle. She also sings “Down Hearted Blues” in similar style. A common theme is the call and response between Ella and her sideman especially Wild Bill Davis on the organ (he was one of my dad’s favs.) Davis’ introduction on “In the Evening (When the Sun Goes Down) sets the tone for song as he frames Ella’s notes impeccably here and throughout album. She is also joined by jazz greats Roy Eldridge on trumpet, Ray Brown on bass, Herb Ellis on guitar, and Gus Johnson on drums. The liner notes of this album include “Historical Note – The Blues” by Frederic Ramsey, Jr. It excellent history lesson on the evolution of the blues. Ella will always hold a special place in my musical heart. I first saw her perform when I was eighteen at the Chicago Jazz Festival. It was an amazing experience that I have never forgotten. This entry was posted on Friday, June 30th, 2006 at 4:11 pm. It is filed under Flashback Friday, Radio.Blog. You can follow any responses to this entry through the RSS 2.0 feed. This is a great post! I must say I’ve never really “listened” to her before. I’ve always heard, but as I’ve listened to your radio blog…I can really hear her soul. You never cease to amaze me, and I know it had to be a serious labor of love. You definitely need to DJ! Writing to request your contact info. Please send over name, address, e mail and phone contact please.